Microsoft has unveiled the Surface Studio 2, giving the device its first update since launching in late 2016. The refresh from 6th gen Intel Skylake silicon to a new 7th gen Intel Kaby Lake i7-7820 quad-core chip in the base model brings with it the modest performance gains with which we are familiar. However, it does get a 50 percent boost in graphics performance switching from Nvidia 9-Series graphics to a 10-Series GeForce GTX 1060 mobile GPU. The superb 28-inch 4500 x 3000 PixelSense display continues to support 10-point multi-touch, pen and the Surface Dial, making it a favorite with creative professionals. This time around, Microsoft says that it has paid particular attention to color calibration which is especially important for this segment of the market. Brightness is also up 38 percent while contrast is improved by 22 percent courtesy of new LCD and oxide transistor tech. Unfortunately, an ongoing and strange absence for a machine in this class is Intel's Thunderbolt 3 I/O, but the Surface Studio 2 does at least include a USB-C port. The starting price for the Surface Studio 2 is set at US$3,499 which gives you a quad-core chip, 16GB of RAM and a 1TB SSD. The top-end model will set you back US$4,799 but will ramp up the specs to 32GB of RAM and a 2TB SSD. 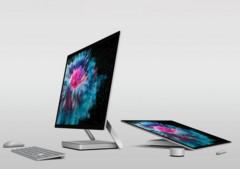 The Surface Studio 2 is up for pre-order in the US and select markets and will ship on November 15.